Luise Kloos errichtet auf Einladung von HDLU Zagreb anlässlich des Internationalen Holocaust Erinnerungstages und des 70. Gedenkjahres Ende II. Weltkrieg eine großdimensionale Glasfaserinstallation. „SILENT LIGHT“ wird durch die optischen Lichtfasern eingefangen und reflektiert. Ein künstlicher Natur-Licht-Raum entsteht, der durch den runden Galerieraum, dem Licht von oben und den Steinen am Boden in eine Atmosphäre der Erinnerung und Kontemplation einlädt. 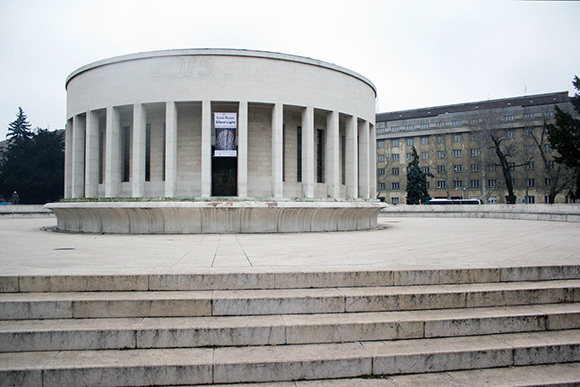 Luise Kloos will build a large-dimensioned site specific fiberglass installation in Bačva Galerie, HDLU on the occasion of the International Holocaust Remembrance Day 2015. „SILENT LIGHT“ will catch the environmental light and reflect it. 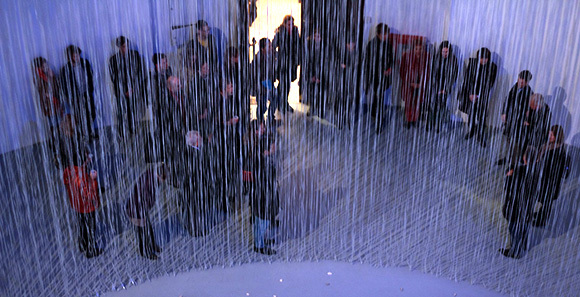 Luise Kloos produces two extraordinary experiences of perception with her installation. 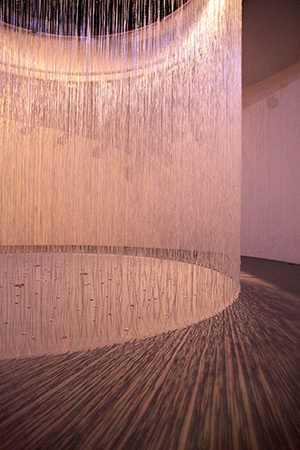 The cylindric curton-like thread structures create an extremely unusual spatial situation best described as “flowing”, in which we can only sense an “interior” (in which the visitor is) and an “exterior” (through which he can look through the weave of threads). Beams of light penetrate the threads (which are the basic material for optical fibre threads indispensable in the telecommunications industry). They are passed through into the “interior” where they create an unreal, dreamlike, misty light situation. It´s an artificial nature-light-space” and invites to remember and to contemplate.